SEOUL (Reuters) - The breakdown at last month's U.S.-North Korea summit has left South Korean President Moon Jae-in with little room to manoeuvre and exacerbated divisions within his government over how to break the impasse, three sources familiar with the issue said. Meanwhile, a recent U.S. State Department human rights paper criticised Seoul for pressuring North Korean defectors not to denounce Pyongyang. 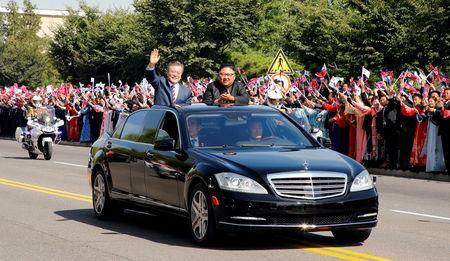 A separate U.N. report noted Seoul's failure to declare its transfer of petroleum products used in the North, and published a photo of Moon and Kim riding in an "illicitly obtained" limousine in Pyongyang. After days of pressure, the party apologised on Tuesday for using "black-haired foreigner," while Moon's office said it would take action if the reporter were "under real threat." 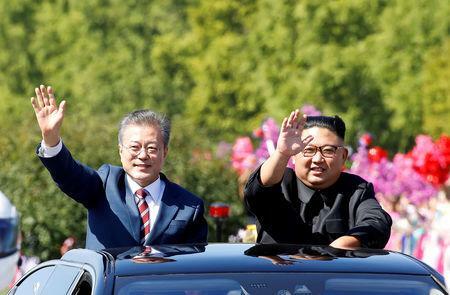 "They do think South Korea could be a catalyst that helps the negotiations go in the right direction, but in a way that brings Kim's commitments that deserve U.S. rewards," said Shin Beom-chul, a senior fellow at the Asan Institute for Policy Studies in Seoul.